Lee Jin-gyu fell for his 'dakimakura' - a kind of large, huggable pillow from Japan, often with a picture of a popular anime character printed on the side. In Lee's case, his beloved pillow has an image of Fate Testarossa, from the 'magical girl' anime series Mahou Shoujo Lyrical Nanoha. 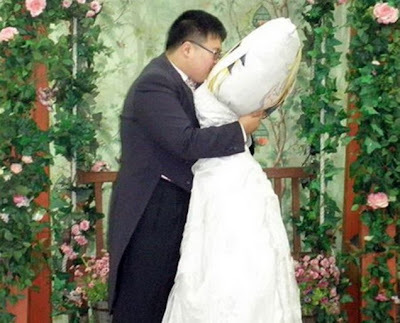 Now the 28-year-old otaku (a Japanese term that roughly translates to somewhere between 'obsessive' and 'nerd') has wed the pillow in a special ceremony, after fitting it out with a wedding dress for the service in front of a local priest. Their nuptials were eagerly chronicled by the local media. 'He is completely obsessed with this pillow and takes it everywhere,' said one friend. The pillow marriage is not the first similarly-themed unusual marriage in recent times - it comes after a Japanese otaku married his virtual girlfriend Nene Anegasaki, a character who only exists in the Nintendo DS game Love Plus, last November. I know what I disappointment I am to you. I know how much you hoped that by now, I would have worked my way to a respectable career, or at least moved out of the basement. But I need you to start accepting the choices I've made. I don't think that's too much to ask. A man has to follow his heart and his dreams, or else he ends up nowhere. You told me that once, and I have lived my life by that advice even when you refused to support me in the past, like the time I went on the all Kool-Aid diet for three weeks and ended up giving myself diabetes. I followed your advice then, and I'm following that same advice now too, and so I have some news to share with you: I married Liz. I know the two of you haven't always gotten along in the past, and I know you don't particularly trust her. She confessed to me about all the times she tried to force herself on you, but she's really sorry about all of them, and she promised they won't happen again. It's water under the rug at this point as far as I'm concerned. I hope you can believe that too, and I hope you can find it in your heart to support this marriage, because it's what both of us really want. It's funny, we were talking on the bus this morning on our way to City Hall, and she actually mentioned how much the two of you have in common. I wonder if maybe that's what you dislike about her? It's a perfectly natural thing for a boy to want to marry a girl who is just like his father, but if you need time to acknowledge and accept that, I understand. We're going to the arcade now to play video games until I run out of my allowance, but I just want you to know that I love you, I'll be home by 7, and I would really appreciate it if you could buy us a package of gummi bears and some Cherry Kool-Aid to celebrate our good news. Liz is really excited to have you as a part of her life and her family now, so I hope you can be equally welcoming to her. I love you more than I love Ryan Seacrest, Dad. I really mean that. P.S. Liz asked if she could call you "daddy" from now on, but she said she only meant it in a purely sexual way. Isn't that cute?